Provide comfort for the family of Annie Blom with a meaningful gesture of sympathy. It is with heavy hearts that Annie’s five daughters announce the passing of their dearly loved, vibrant, ever smiling and caring mom. 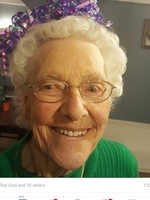 Annie passed away peacefully with her loving family by her side at St. Mary’s General Hospital in Kitchener on Sunday, April 7, 2019. 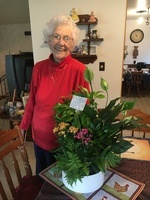 Born in Holland on October 7, 1929, Anna Maria (née Oud) Blom of Seaforth was in her 90th year. Beloved wife of the late Nicholas Blom (Aug. 30, 2008). She leaves an incredible legacy. Dearly loved mother of Elizabeth Moir of Seaforth, Willy Groothuis of Kitchener, Mary and Mark Vandyk of Cambridge, Rita Savauge and John Hackett of Cambridge, and Annette and Ron Hak of Kitchener. Her cherished 15 grandchildren and 22 great-grandchildren will miss her welcoming smile, hugs and kisses along with the ever present Dutch tarts, lemon cake, meatball soup and gingerale. Her kind hearted nature and loving support will be held close in their memories. Annie is also survived by her sister Cora Jeppesen, two brothers-in-law, and one sister-in-law. She will be sadly missed by her nieces and nephews who fondly referred to her as the matriarch of the family. 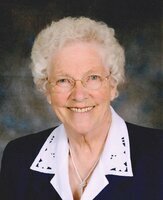 Annie was a member of St. James Catholic Church and the CWL in Seaforth. 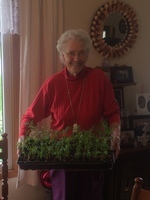 She took great pride in taking care of the flower beds at the church as well as volunteering at the Seaforth Manor. Visitation will be held at McGlynn Family Funeral Home, 87 Goderich St. W., Seaforth, 519-527-1390, on Wednesday, April 10, 2019 from 2-4 and 7-9 p.m. Funeral Mass of Christian Burial to celebrate Annie’s life will be held at St. James Catholic Church, 22 Victoria St., Seaforth, on Thursday, April 11, 2019 at 11 a.m., and will be led by Fr. Clare Coleman. Interment will take place in St. James Catholic Cemetery followed by a reception at the Seaforth Legion, Branch 156. Consider providing a gift of comfort for the family of Annie Blom by sending flowers. planting new life in return for everything you have done to impact mine. love you forever. Dear Mary, Mark, Rita, John, Annette, Ron, Liz & Willy We are so sorry to hear of your mom’s passing. She is at peace now, and once again united with Nick. We will miss her beautiful smile, and her gentle nature. She had a wonderful gift of conversation and she could, and would talk to anyone. She leaves quite a legacy of family and she lives on in all of you. Our thoughts and prayers are with you during this difficult time. Love from Deb and Jack Vandyk.